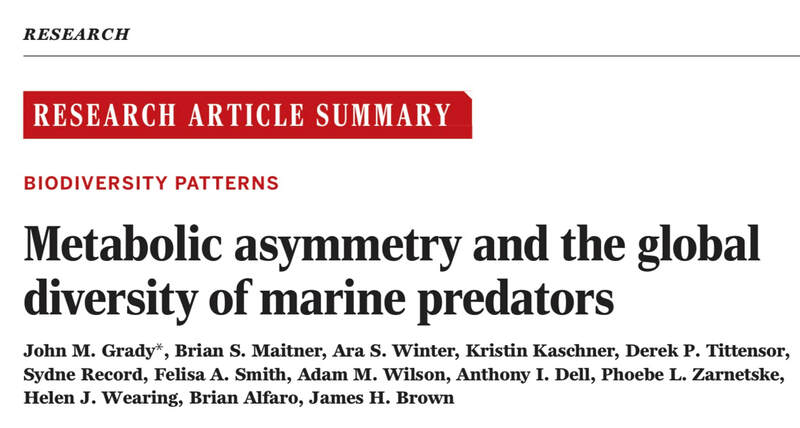 ​I am broadly interested in how traits affect interactions and emergent features of ecology. ​In particular, how do differences in metabolism and body size drive spatial and temporal patterns of diversity? Does energy provide a framework for linking levels of biological organization? Mexico in 2016 under Felisa Smith. I am currently in a postdoctoral position at the National Great Rivers Research and Educational Center in St. Louis, IL, studying movement and metabolic asymmetries between endotherms and ectotherms with Anthony Dell. One of the best things about science is traveling! Discussed whale movement, pondered the Leaning Tower of Pisa and joined an after hours dance party with movement folks. Special thanks to Ran Nathan and Tony Dell for getting me there. The cliches about Italy's beauty are all true. After watching innumerable BBC videos on marine life, I decided to contribute something myself. A synthesis and theory paper on the merits of being warm or cold-blooded at sea.